Is NMR the same as MRI? MRI, or magnetic resonance imaging, is based on the same principles as NMR spectroscopy. While NMR is typically used to investigate problems related to chemistry and physics, the goal of MRI is to image nuclei in living things. This is accomplished in a way similar to how an NMR spectrum is collected except that the applied magnetic field has a gradient, meaning the field strength is different in different parts of the sample being imaged (usually human or animal tissue). This allows the use of microwave radiation to excite nuclei in individual slices of tissue, one at a time. The gradient in the magnetic field can be varied to collect the MRI of different slices of tissue, which can then be analyzed to get a picture of what is going on inside the body. An MRI (magnetic resonance imaging) machine can be used to noninvasively examine the inside of a patient’s body using a magnetic field. 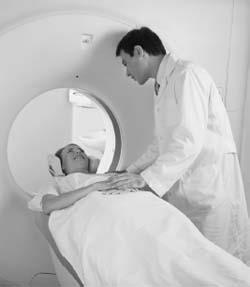 MRIs are very useful in diagnosing illnesses such as cancer, the effects of strokes, and torn ligaments.